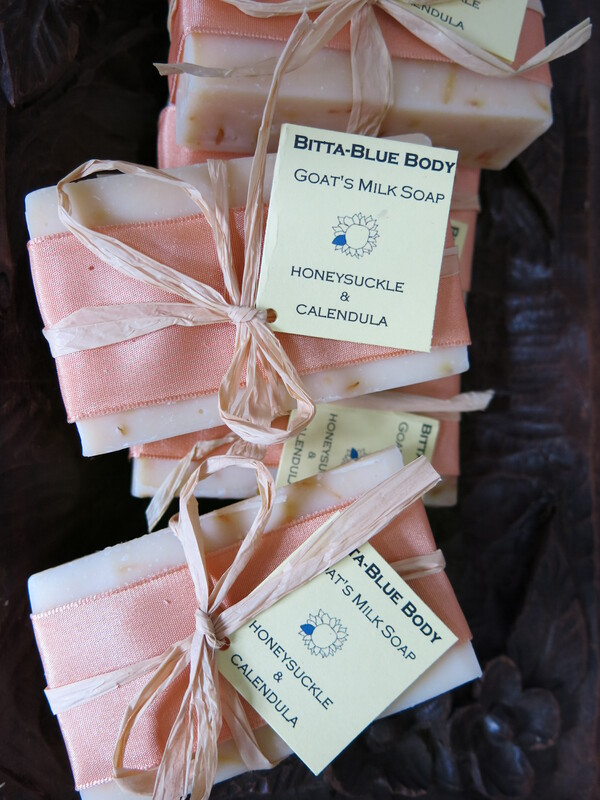 In addition to organic food, we sell goat’s milk bath & body products handmade locally at our farm. 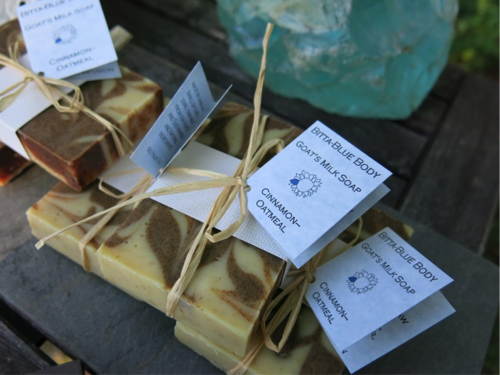 We offer natural and sustainable soaps, lotions, milk baths, lip balms, and more to nourish your skin: your body’s biggest organ! 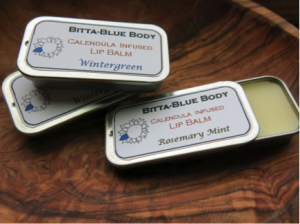 Everything we make contains ingredients from our farm from the goat’s milk to calendula flower petals used to make a healing infusion used for lips and skin. Visit our Etsy Shop to purchase our unique artisanal bath & body products! 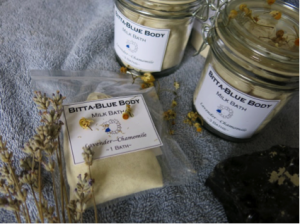 Or contact bittabluebody@gmail.com for more information and to hear about where you can find our products locally. 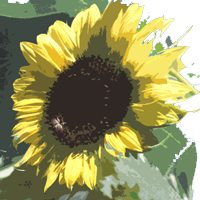 What you put on your skin is absorbed into your body including harsh unnecessary chemicals. 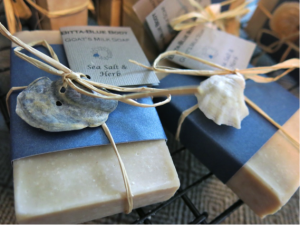 I am committed to making my soaps natural and sustainably. I use only colorants derived from nature such as turmeric and green algae and absolutely NO palm oil (a common soap making ingredient used to create a harder lathering bar, the manufacturing of is a growing contributor to deforestation and habitat loss for creatures such as the endangered orangutan). I use sustainable and organic sources for my ingredients whenever possible, and my lotions use a Paraben and Formaldehyde FREE preservative. 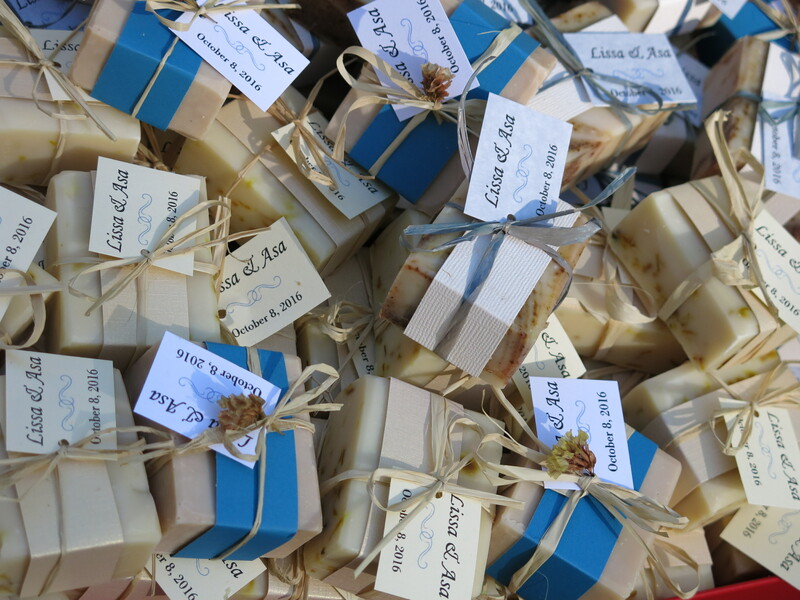 Fat is the major ingredient in soap making but not all fats are equal. While some fats contribute to a harder bubbly bar, others condition the skin. When goat’s milk is used in soap it acts as a “superfat” that packs the soap with increased ability to moisturize. Alpha-Hydroxy acids. 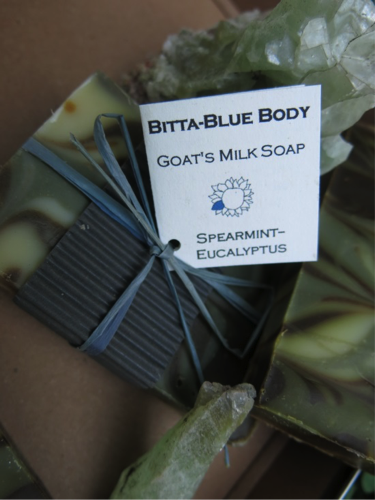 Goat’s milk contains lactic acid, a natural alpha-hydroxy acid that helps to break down dead skin cells. This natural rejuvenation is great for dry, aging and damaged skin. Vitamins abound in goat’s milk. One of particular note is Vitamin A, which helps to repair damaged tissue and reduce wrinkles, and aids troubled skin such as acne. Minerals such as selenium (found in goat’s milk) is believed by scientists to help your skin fight sun damage. Each of our soaps is unique—I do NOT use one recipe and vary merely the scent! This allows you to pick the soap that not only suits your olfactory tastes, but also your cleansing and conditioning needs which vary from person to person and season to season. 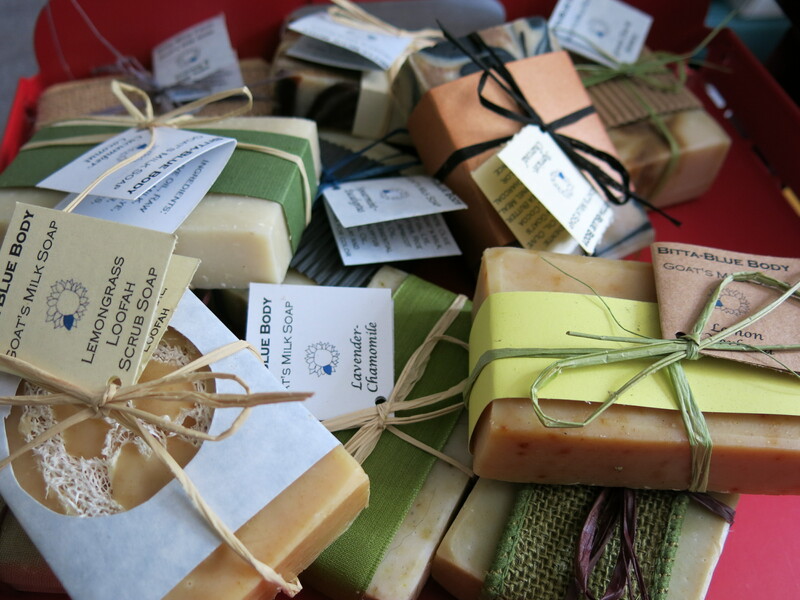 Our names represent some of what’s in the soap and not just the fragrance. Visit our Etsy shop to find out which soaps we have in stock! 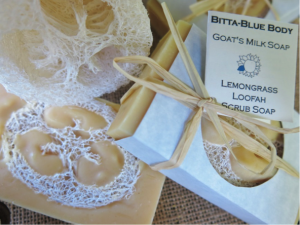 Through lotion your skin can reap all of the benefits of both goat’s milk and carrier oils (unlike soap in which many oils lose their properties or become transformed in the saponification process)! 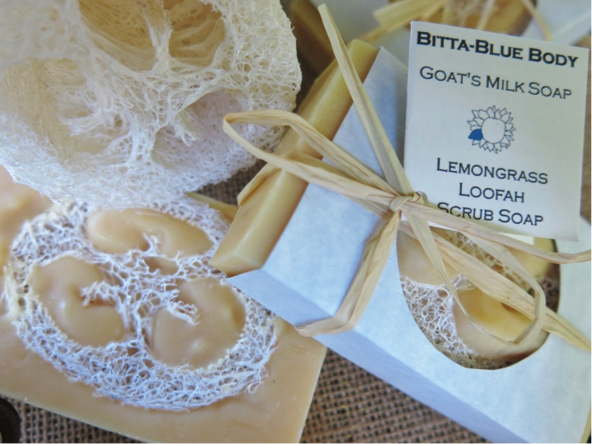 Goat’s milk, combined with nourishing oils high in such things as vitamin E, creates a emollient non-greasy lotion. All of these lotions are made with a paraben and formaldehyde FREE preservative. 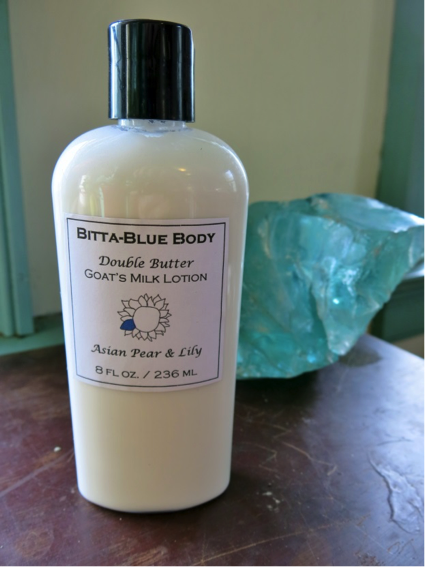 This goat’s milk lotion is rich and creamy with the dual power of shea and kokum butters! The carrier oils—Avocado, Apricot Kernal, Sunflower, Jojoba and Meadowfoam seed— and butters combine with milk to condition and smooth the skin naturally without a waxy or oily film. In addition to “unscented,” my double butter lotion comes in Lavender-Vanilla (made exclusively with a natural infusion and essential oils), as well as Asian Pear & Lily, or Spring Clover scents. This lotion combines the nourishing qualities of goat’s milk with the naturally healing and soothing qualities of aloe gel, coconut and rosehip seed oils. The resulting lotion is light and cooling, a summer necessity especially for sun damaged skin. Additionally, try this lotion on razor burn or as a natural substitute for shaving cream which often includes harsh chemical ingredients. This lotion comes in Coconut-Lime-Verbena or Cucumber scents. Calendula Infused Lip Balm, Lavender-Chamomile Milk Bath and More!